Hello gang, Lisa here! OK...Who is ready for football season to start?! I know I am. On Saturday, Aug. 30 the No. 21 ranked USF Bulls will take on the Tennessee-Martin Skyhawks at 7 p.m. at Raymond James Staduim. This is the first year the Bulls will open their season as a Top 25 contender...kind of a big deal! So, come to the game with your school spirit in full force and be prepared to bring home our first W.
As a former USF cheerleader, it&apos;s been really neat to watch this team become what is has. When I cheered backed in 2000, there weren&apos;t very many fans in the stands and we weren&apos;t winning too many games... Now, it&apos;s completely opposite. A full stadium really makes a difference and when you&apos;re cheering for a team who was at one point ranked No. 2, it feels pretty darn good! 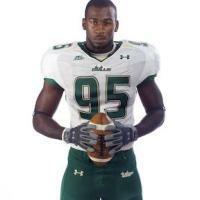 Also, did you know that USF recently unveiled a new road football jersey? The re-designed jersey is part of a new deal with Under Armour that showcases cutting edge fabric technology and comfort. I thought that was pretty nifty! So as the season kicks-off, come support your USF Bulls! Other home games include Kansas, Pittsburgh, Syracuse, Rutgers, and UConn so we have all those to look forward to this year. We have a fun, eventful and challenging season ahead of us, and your support will play a big role in the season&apos;s success! I better see you at the games. Cheers!